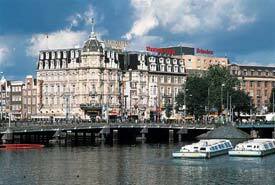 ABOVE: The four-star Hotel Park Plaza Victoria in central Amsterdam. Amsterdam has a vast selection of hotels, hostels, and other lodgings, and we haven't attempted to list all of them here. Where possible, we've linked to hotels represented by Booking.com, Europe's largest reservations service, which is based in Amsterdam and has a "best price guarantee." We've also linked to a variety of other hotel, hostel, apartment, and camping sites, so you can explore a wide range of choices and compare prices before you book. Use the accommodations index below to get started. Amsterdam hotels fill up quickly in summer, during holiday periods, and on weekends (when many British travelers and shoppers visit from across the Channel). Book ahead for the best choice of rooms. For reviews and ratings by paying guests, see Booking.com's listings. At the lower end of the hotel spectrum, rooms may be small and rather dreary--and in older buildings, some rooms are likely to be better than others. You're most likely to be happy with your accommodations if you stay in a 3-, 4-, or 5-star hotel.